If the endless supply of crazy Russian dash cam videos haven’t convinced you to get one for your car, maybe Garmin’s new Dash Cam 35 will. In addition to documenting accidents, it now has Forward Collision Warnings to remind drivers when they’re following too close to another vehicle, risking a crash. As soon as the car is turned on, Garmin’s new Dash Cams start recording. Hi-def video is captured to an included microSD card and footage is recorded in a continuous loop so the card never actually gets full. But when a built-in sensor on the dash cam detects an impact, it saves the footage before and after the incident so that it can be used as evidence. The new $200 Garmin Dash Cam 35 includes a three-inch LCD display, the aforementioned Forward Collision Warnings to help keep the car at a safe following distance in traffic, and GPS so that the exact date, time, latitude, longitude and speed of the vehicle are documented after an accident. It also includes a database of red light and speed cameras giving drivers an advanced heads up so that they can adjust their driving accordingly, and slow down. 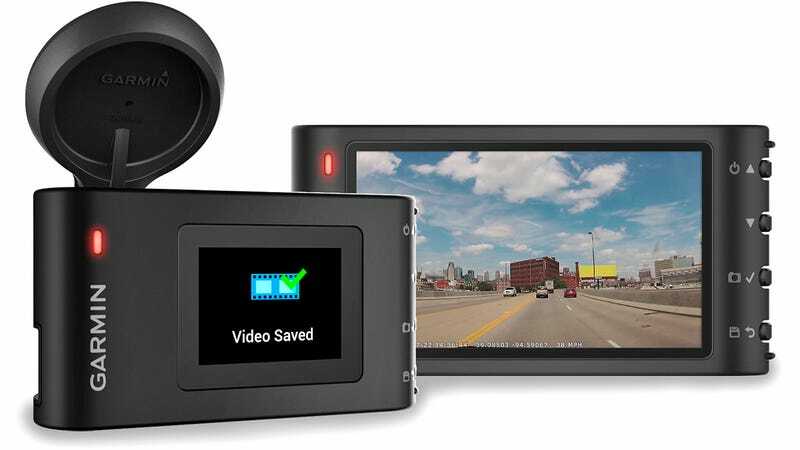 Garmin also has a cheaper $170 version called the Dash Cam 30 which lacks the built-in GPS and driver alerts, but also takes up less space on your windshield with a smaller footprint and a compact 1.4-inch LCD display. If all you’re after is proof that you weren’t at fault in your next fender bender, the smaller version might actually be the better way to go, especially since it’s less of a distraction while you’re trying to focus on the road.